Report by Doug Enriquez for ProWrestling.com! Join us for live coverage starting at 8/7c. Refresh this page for updated results throughout the night! We are starting the show with Stephanie McMahon in what they are calling “Breaking News” concerning the main event of WrestleMania. Stephanie says we are just 6 days away from WrestleMania. She says she is going to add a 4th competitor….Stephanie McMahon! She says it is an April Fools joke! She says that the real news is that Ronda Rousey, Charlotte Flair, and Becky Lynch will have ALL titles on the line! She says that three women will have their hearts and souls left out there on the mat, and now it will be WINNER TAKES ALL. 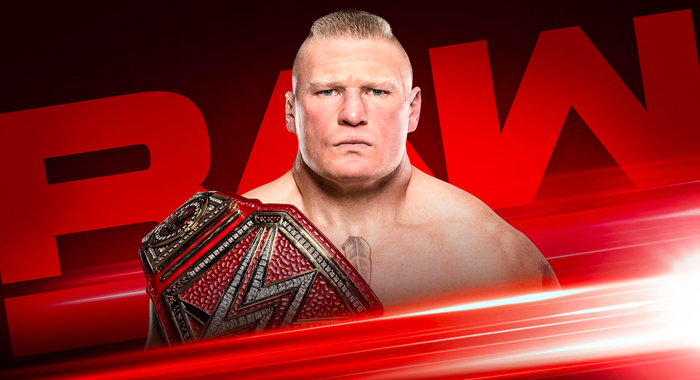 We are starting Raw from one hot moment to the next…BROCK LESNAR IS HERE! The Universal Champion makes his way to the ring flanked by Paul Heyman. He says that Stephanie McMahon was right in saying “winner take all” because the winner…Brock Lesnar…will take everything that Seth Rollins has, and that’s what he does at WrestleMania. He took the streak from the Undertaker at WrestleMania. Last year he took the hopes and dreams of Roman Reigns when last year people believed that Roman Reigns would dethrone Brock Lesnar. He says that that on Sunday Brock Lesnar will violate Seth Rollins and desecrate the good name that is WrestleMania. He will defy the saying that life is not what you want it to be, it is what you make it. Because after the match, they are going to discuss what is next in the career of Brock Lesnar because Seth is just an afterthought to Brock Lesnar. BURN IT DOWWWN! Seth marches right to the ring and steps to the face of Lesnar and Brock just smiles. Seth says it isn’t just the biggest match of Seth’s career, it’s the biggest match of Brock’s career because nobody wants him here. The locker room and the people are sick of Brock Lesnar. Brock smiles and Seth knows that Brock doesn’t give a damn. He says that Seth beating Brock may be improbable, but it is not impossible. He is going to beat him and there is not a damn thing he can do about it. Seth gives Brock a low blow and starts to beat down on him, but Brock picks Seth up and hits him with a German Suplex! Brock picks up Rollins for an F5, but Seth slips back and hits ANOTHER low blow to Lesnar. Seth winds up and hits the Curb Stomp on Lesnar and holds up the belt before walking away.